Neuxpower makes simple effective software to shrink the files that Zip can’t. Over 2 million people worldwide use NXPowerLite Desktop to reduce the size of their email attachments, and over 1,000 companies already use NXPowerLite for File Servers and NXPowerLite for Microsoft Exchange to proactively manage storage growth. We are a small growing team of smart, driven people who take ownership of creating and promoting truly great products that people love. Complex problems inspire us to create simple and effective solutions with software solutions that actually solve the root problem. 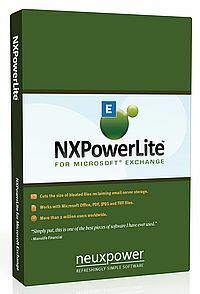 NXPowerLite will compress PDF, Microsoft Office and JPEG files simply and effectively, making them easy to email as attachments. It is especially effective on files that don’t zip well. NXPowerLite integrates with your email to automatically shrink email attachments as they are sent. In Outlook 2010 or later you can also compress attachments on emails you have received. Optimized photos stay in the same format - a JPG remains a JPG. It will look and feel identical to the original, just much smaller. Large PDF and Microsoft Office files often contain lots of high-resolution images, and background data not required for normal use of the file. By removing this data and unneeded excess bytes from internal graphics and standalone JPEGs, NXPowerLite radically reduces files to their smallest size - without compromising quality. We're big fans of keeping things simple, so we designed the keys for NXPowerLite to work in either the Windows or the Mac version. So if you change platform you don't have to buy your software again. It also means if you are buying multi-user licences you don't need to say how many of each platform you want up front. 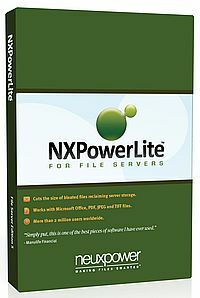 NXPowerLite reclaims server space by replacing large PDF, Microsoft Office, JPEG and TIFF files with smaller optimized versions. It automatically monitors your server, reclaiming wasted capacity, shrinking backups and slowing down storage growth. NXPowerLite is an easy way to extend server life and get more value from your hardware investment. Download our free Quick Scan tool that will quickly tell you how much supported content you have and estimate the potential savings. The scan is fast, free and read-only, so it will not change your files. 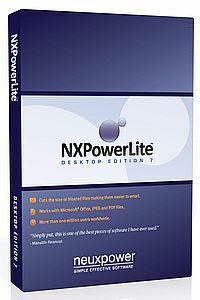 NXPowerLite runs as a background Windows service. It can optimize content on any storage device in the same Windows domain as the machine on which it is installed, including EMC, NetApp and Novell Netware servers. It is also fully compatible with Windows virtual environments. Choose folders - Select folders to optimize on your server, or on any storage device that Windows can see. Set your rules - Select which folders and file types to optimize or exclude, choose your settings and schedule when the rules take effect. Schedule and go - Use the built in schedule function or use Windows task scheduler to control the service from other events. Files are analyzed to identify any compatibility issues prior to optimization. Optimized files are tagged to avoid re-optimizing and for logging purposes. Files are copied and optimized separately to the originals. Last-accessed or last-modified dates of files are not altered to avoid conflict with other software. RECLAIM STORAGE. EXTEND SERVER LIFE. SLOW GROWTH. NXPowerLite replaces large PDF, Microsoft Office, JPEG and TIFF email attachments with smaller optimized versions to instantly reclaim email storage space. NXPowerLite for Microsoft Exchange reclaims wasted capacity, shrinks backups and slows down the growth of your Exchange store. Add NXPowerLite to your storage optimization toolkit as an easy way to extend server life and get more value from your hardware investment. NXPowerLite connects to Exchange via the Exchange Web Services (EWS) API, and uses our proven optimization engine to ensure email attachments are safely and efficiently reduced. To make it easy to run NXPowerLite at convenient or low-traffic times, it is fully compatible with Windows task scheduler meaning you can 'Start' or 'Stop' the service from other events. NXPowerLite will remember where it was stopped, and resume smoothly from where it left off. NXPowerLite generates comprehensive reports detailing how storage was being used and the savings obtained by optimizing email attachments. Use our free scanning utility to find out how much space you could save by optimizing the files in your Microsoft Exchange server. The tool will generate a detailed report by scanning your content and comparing it with average reductions from our other customers to quickly estimate how much storage could be reclaimed using NXPowerLite. The scanner is free and read-only, so it will not change your files. NXPowerLite has been carefully designed to ensure that documents and file attachments remain safe at all times while being optimized. It uses recognized Microsoft standard protocols and implementation methods to ensure the data integrity of the Exchange server. NXPowerLite analyzes files to identify any compatibility issues prior to optimization. Files are copied and optimized separately to the originals, and if any issues are identified prior to or during optimization, or if NXPowerLite fails to reduce the size of the attachment, the original file is left untouched. All the above formats contained within zip archives.